Only 0.7 percent of federal transportation funds are spent on improving pedestrian facilities. Several of our supporters recently attended DuPage County’s public meeting about changes coming to the Illinois Prairie Path. We are happy to report that the county is proposing a new side path called the Eola Connector (see image) to improve trail connectivity between the Aurora Branch of the Illinois Prairie Path and several other nearby paths and destinations. 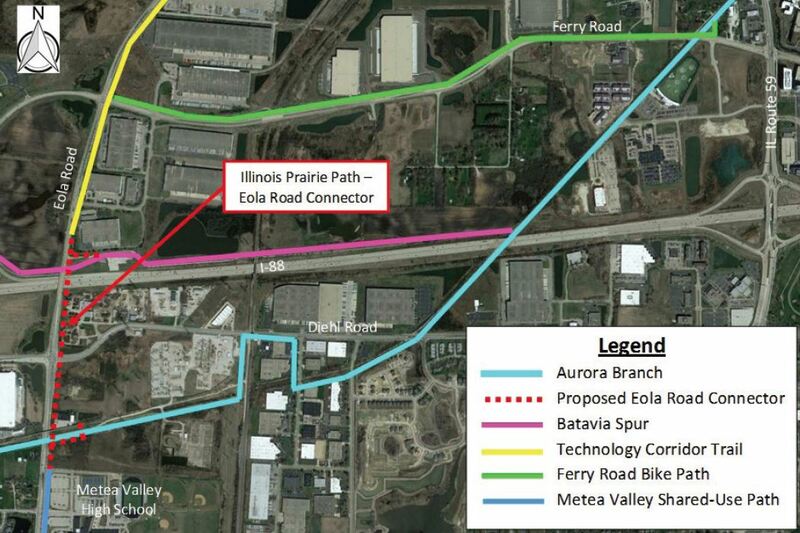 The Eola Connector proposal includes a 10-foot, paved, multi-use path along Eola Road to connect the Aurora Branch to the Batavia Spur, the DuPage Technology Corridor Trail, and Metea Valley High School and its shared-use path. The proposal also includes the widening of the Eola Road bridge over Interstate 88 to accommodate the multi-use path. Once the design is approved, the county will need to acquire land at certain locations along Eola Road. Construction is then slated to begin in 2020. Improving connections within our region’s trail network is one of the top priorities Active Trans’ identified in our recently published Suburban Bikeways for All report. Additionally, earlier this summer, DuPage County launched a new web application that allows users to explore the area’s extensive trail system of more than 500 miles of routes. The app allows users to plan out their journey and pinpoint parking lots, rest areas, restrooms, popular destinations bike shops and emergency assistance facilities nearby. We are impressed by DuPage County’s continuous efforts to improve trail connectivity in the region and make it easier and safer for residents and visitors to explore the county by bike and by foot. We hope these efforts will continue to gain momentum. We will keep you updated as the Eola Connector and other trail projects move forward. If you would like to get involved in improving trails and biking and walking conditions in your community, consider joining our Bike Walk Every Town Suburban Summits in September and October.